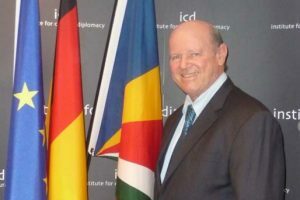 Bangkok (Thailand) – April 25, 2017 (travelindex.com) – Alain St.Ange, the Seychelles Candidate for Secretary General of the United Nations World Tourism Organisation (UNWTO) has rejected the call by Zambia on behalf of the African Union for him to withdraw from the race for SG of the UNWTO. “The African Union has never imposed Zimbabwe on Africa, they endorsed them and the democratic right of Member States is to choose who they want. The UN remains a Democratic Institution and we all need to respect this. The Indian Ocean Commission (IOC) with four African Union Members on their part endorsed Seychelles” said St.Ange in Bangkok earlier today to the Press. “All along our campaign we did not speak of other candidates, but continued to present ourselves to Member States as the credible candidate. It is deplorable to see acts of trying to impose a candidate on Africa knowing full well that just in the recent elections for the Head of the same African Union how promises for votes were manipulated even as late as the night before forgetting all dignity of undertakings made and now we see this veil attempt to force a candidate on to member States. As some Candidates were sure of a win only to see their African Colleagues changing sides and breaking all promises made” St.Ange said before adding that on so doing the African Union is shooting their ‘Coup de Grace’ on Africa and are ensuring that the 2017 Elections does not have an African Representative coming out victorious. South America has two Candidates and we do not see such running about, but instead a cordial dialogue in civility with respect is evident. “Africa knows that Zimbabwe cannot pull off a win at this coming election. The sanctions in place, the state of the economy, the existing political situation and the reprinting of money all do not auger well for any votes apart from Africa wanting to sink with its ship” a political analyst added at this press meeting that brought but a candid smile to St.Ange’s face. Candidates in this coming UNWTO election know full well that they need to pull votes from the four corners of the world for a win. The elections are set for the 12th May and will be held in Madrid. Africa has two Candidates (Seychelles and Zimbabwe), South America has two as well (Brazil and Columbia) over and above Georgia and Korea. These are the countries set to be on the Ballot Paper on the 12 May where the best candidate will win. The Candidates are representing a Country on this election. “I am going into the elections content that I carried a clean and open campaign. I know that the Seychelles Tourism for All campaign platform has resounded well because the world is tired of discrimination and the lack of respect for people. Respect for colour of the skin, religion, politics, those with different sexual orientation, those with a disability or another, gender etc need to be an undertaking made openly by all candidates. How can a United Nations Body tolerate to have one of its key organisation led by a person who discriminates. The women groups, the disabled, the LGBT stand up today. I was attacked because I am white and yet we want to still be tolerating this for our United Nations Organisation. This is what the press must be calling for” a smiling St.Ange said in Bangkok.